MUZAFFARABAD: Deposed prime minister Nawaz Sharif on Monday said the judiciary “ruined his plans” for the development of Kashmir, particularly the eradication of unemployment. Referring to the Panama case verdict that disqualified him from office last year, Nawaz asserted that no decision whatsoever can break his bond of love with Kashmiri. 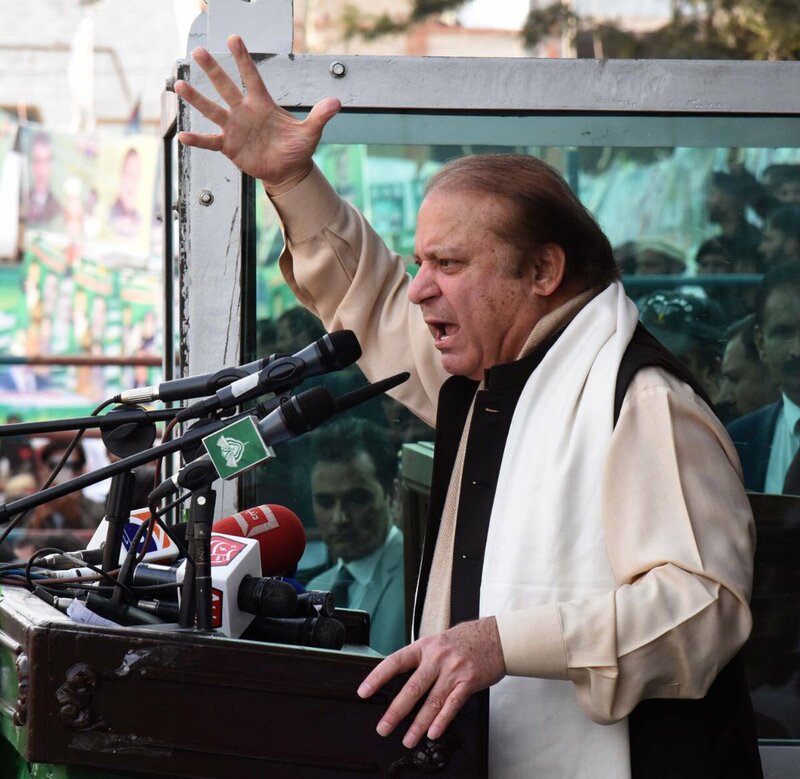 Addressing a public gathering organised by his Pakistan Muslim League-Nawaz (PML-N) regarding Kashmir Solidarity Day at the Muzaffarabad University College Ground, Nawaz said, “[Even though] I have been disqualified from Pakistan, [I am] qualified for Azad Jammu Kashmir” as he announced to dedicate his services to the Kashmir’s development. The PML-N president took a jibe at the superior judiciary as he evoked his popularity, saying “They ruined my plans for the development of Kashmir, had I not been disqualified I would have eliminated poverty from the region.” He went on to add that his bond of love with the people of Kashmir cannot be quashed and his heart beats equally for Pakistanis and Kashmiris. “Respect the vote. Respect Pakistan,” Nawaz went on to roar amid chants of vote ko izzat do and Kashmir bane ga Pakistan (Kashmir will become Pakistan) as he further bashed the judiciary over the Panama Papers’ verdict that ousted him. He began his speech by thanking the hosts and the people present at the venue and predicted that the freedom struggle in Indian-held Kashmir will achieve victory soon. The three-time premier said he has never seen a bigger rally than this in the history of Kashmir, adding that the rally today (Monday) is three times bigger than the one he addressed at the same venue after winning the last general elections in 2013. The PML-N chief said that he had several plans for the AJK’s development that would have eliminated unemployment from the region, but they were all ruined due to his disqualification in July last year. Nawaz was disqualified by the Supreme Court on July 28, 2017, in the Panama Papers case. Following the disqualification, Nawaz and his daughter Maryam Nawaz have launched an anti-judiciary campaign, with accusing the judiciary of acting in bias. While evoking the importance of the Kashmir Solidarity Day, he paid tribute to the resistance in India-held Kashmir and lauded their “bravery”. He vowed to stand by the people of Kashmir that were struggling for their right to self-determination. “The brave people of Kashmir are being blinded by the pellet guns used to fire at them,” Nawaz said, referring to incidents of injuries resulting from Indian forces’ use of pellet guns against the separatists and citizens in Kashmir. “Don’t lose heart! God is with you,” Nawaz consoled the people. Addressing the participants, PML-N leader daughter Maryam Nawaz also spoke on the occasion, saying her heart bleeds for the people of Kashmir, but remains positive that there will come a day when held Kashmir [Indian-occupied Kashmir] will gain independence from “Srinagar’s slavery”. Recalling the victory in the state’s general elections in 2016, she thanked the crowd for showing their support for her party, saying that the people of AJK “did not vote for any party but PML-N” in the elections. The party had bagged 31 seats out of the total 41 seats in the AJK Legislative Assembly. On his arrival in Kashmir’s capital earlier in the day, Nawaz held meetings with the members of the AJK Council, party leaders, Raja Farooq Haider and others. This idiot is forgetting or lieing out of habit being a congenital liar, that only today he has talked about Kashmir for the first time in his three terms as PM. One feels ashamed but not this man. Fazlul is receiving crores and this is the only progress on Kashmir. I suspect he doesn’t exactly understand the issue. He has done immence damage to lease Modi. He is now working for the release of Jhadev Gurbachan. Masses attendance in Peshawar and Muzaffarabad defiantly shows that NS is selling his narrative successfully and surly wouldn’t digest to opponents. I think PMLN performance is the main reason for this overwhelming response even outside Punjab, otherwise such political engineering wouldn’t be required. Nawaz may be bit corrupt but he is the only hope for the country. Army has clearly colluded with judiciary and brought down his government and imposed life ban on him. This is travesty of justice and just shows how powerful the deep state is in Pakistan. There is no hope for authentic democracy in Pakistan for next 50 years. Every time civilian leader becomes assertive Army steps in to dethrone him. Sad part is international community has turned blind eye to this trampling of democracy in Pakistan. It is well known that Army / Judiciary ruined all plans for survival of democracy in Pakistan during last 70 years. In present circumstances, this trend will continue for decades to come unless gullible citizenry realize that their future is only in real democracy.